So often, studio execs are derided for draining every drop of worth from film franchises. You would be forgiven for perhaps sighing when presented with the information that the Harry Potter world was being revisited in a new series of films. Yet there is something a little different about this offering. J.K Rowling herself has penned the script and seasoned Potter director David Yates is at the helm. It exists in the world of Potter but happens before he is even a glint in his father’s eye. It’s a sound creative move, exploring the vast magical world in which Potter and his friends exist. This is a prequel series that feels entirely more organic than many revisits do. This is an altogether different setting to the school based mishaps of the bespectacled Potter. Rowling focuses her mind on New York and turns it into an even more magical place. Her creativity has not slowed and this offering feels completely fresh but with appropriate acknowledgment of what is still to come. 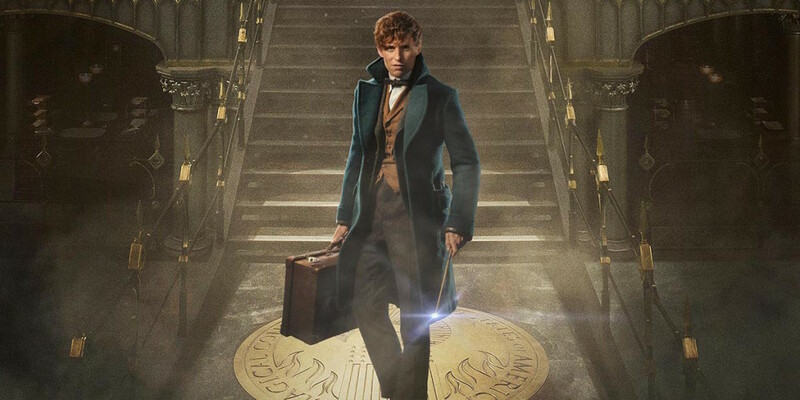 Newt Scamander (Eddie Redmayne) and his text Fantastic Beasts & Where to Find Them will be well known to fans but is equally accessible to first-timers. He travels to America in search of a dealer of rare animals but gets caught up in the politics of magic in the US. Travelling with a suitcase filled to the brim, and more, with magical beasts. 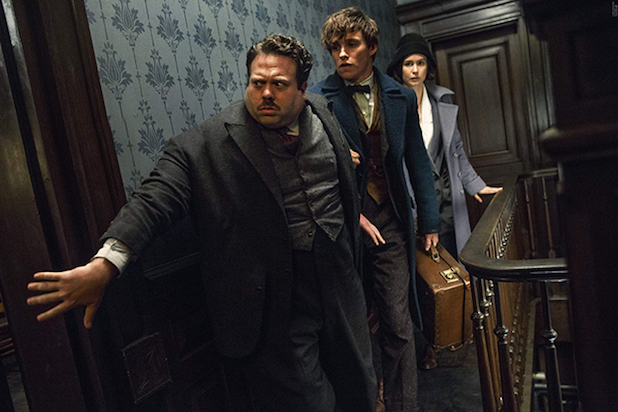 Some of Newt’s creatures escape, causing him to cross paths with a no-maj (that’s a non-magical human to you and I) named Jacob Kowalski (Dan Fogler) and his inability to wipe his memory of the magic he witnessed leads him into the clutches of the demoted auror Tina Goldstein (Katherine Waterston) and the Magical Congress of the United States.The trio set out to recapture the beasts but end up on a much more serious mission to uncover the identity of a magical being that is causing destruction in the city. Yates and Rowling tick a lot of boxes here but never quite hit the mark. The film is well paced with only a few of the action scenes dragging it back. It also works well as a separate and entirely distinct narrative, though it occasionally stutters and feels unfulfilling. Gone are the quirks and silliness of Hogwarts school life, to be replaced with something entirely more adult, dealing with some of the issues facing a magical community concealed from the world. There is a darker tone regarding this subject, touching on the way the X-Men comics and films deal with mutants and humans living together. There is a sense that there is more to come along this vein by the end of the film. Most of all, the film is just plain, old-fashioned good fun, and no more so than when Dan Fogler is on screen. He steals the show as wannabe baker Jacob Kowalski, giving the character a depth of humanity and warmth not found elsewhere in the film. He is hilarious from the moment he enters the film and provides its most intimate and thoughtful moments. Unfortunately, Fantastic Beasts suffers from a pretty big case of the Eddie Redmaynes. For all the affection that Fogler elicits, Redmayne seems determined to quash it. He manages to act his way through this with no feeling and on the odd occasion looks as if he is acting to the back of a non-existent theatre. His failings cannot completely undo the work of the rest of the quite impressive cast. Waterstone does her best in a relatively uninteresting supporting role, Colin Farrell is at his enigmatic finest but underused as Graves, a high ranking auror at MACUSA with a dark secret, and Ezra Miller gets to briefly showcase his talents that are all too rarely allowed to flourish on screen. It seems inevitable that the forthcoming films of this series will contain much of the mirth and excitement of this first instalment, but be dogged by the same problem, Eddie Redmayne. If Dan Fogler is in them, perhaps it won’t matter. Fantastic Beasts & Where to Find Them is available now on DVD, Blu-ray and digital download.